This Nov. 5, 2017, file photo shows law enforcement officials gathering near the First Baptist Church following a shooting in Sutherland Springs, Texas. 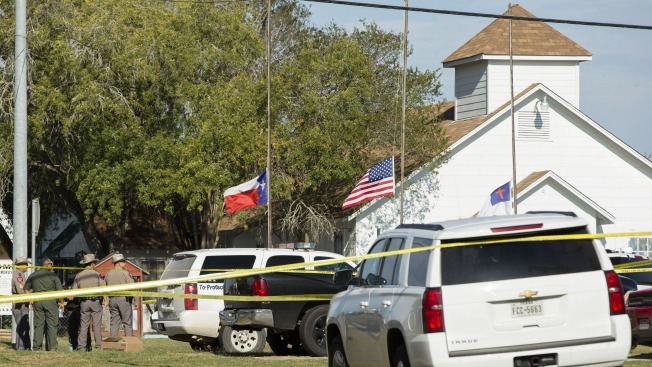 A massacre last year that left more than two dozen people killed at a South Texas church appears to have spurred a dramatic increase in the number of people in that county seeking licenses to carry a handgun. Records obtained by the San Antonio Express-News show 222 gun license applications were received in November in Wilson County following the Nov. 5 shootings at the First Baptist Church of Sutherland Springs. That's up 167 percent from November 2016 and the highest per capita increase among Texas counties with at least 10,000 residents. The newspaper also reports another 175 applied for carry permits in December, up 150 percent from 2016. For all of Texas, the county southeast of San Antonio showed the greatest increase in applicants for gun-carry permits in 2017.